Slow Cooker Minestrone Soup is the perfect easy comforting homemade meal on a cold winter day. Best of all, this set and forget crock-pot recipe is hearty & simple to customize with fresh vegetables and beans. PIN HERE for later and follow me in Pinterest for more recipe ideas! Minestrone Soup happens a lot around here during the winter months. We are soup fanatics and actually make soup and stews all year long. They’re super comforting and perfect for warming up with on a cold day. One of our favorite soups ever is the minestrone soup from The Olive Garden. Now that we have two little ones, it’s been forever since we’ve been to The Olive Garden. But you know what? I think this homemade copy-cat version is even better than I remember. And it’s even better for you. 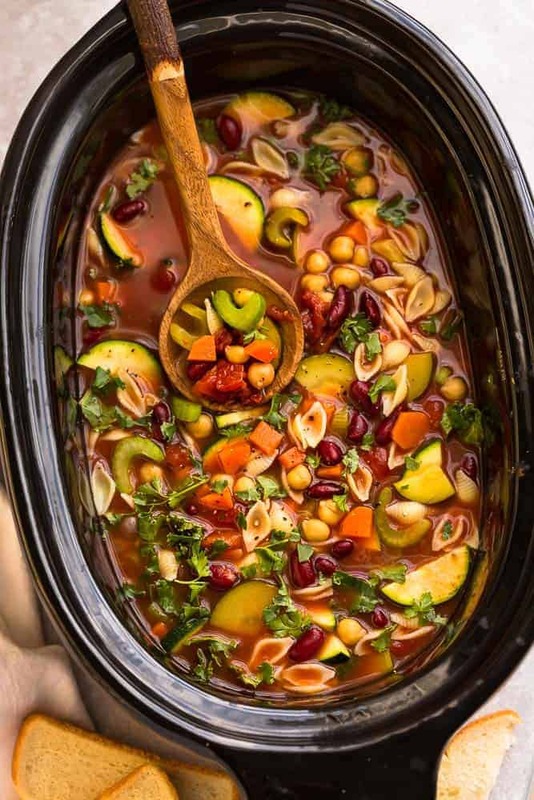 What we love about this slow cooker minestrone soup is how easy it comes together. It’s such an amazing feeling to be able to just dump all the ingredients into your crock-pot on those busy weeknights. How can you go wrong with a bunch of tasty ingredients you just toss into the slow cooker? All you have to do, is let the slow cooker do it’s thing. Then a few hours later, you’ve got a tasty set and forget meal. Don’t you just love lunches and dinners like that? As a busy mom of two, I am a big fan of those kinda meals. And the best part? Slow Cooker Minestrone Soup is an easy dump and go recipe. Super hearty, filling and always hits the spot on a chilly winter day. 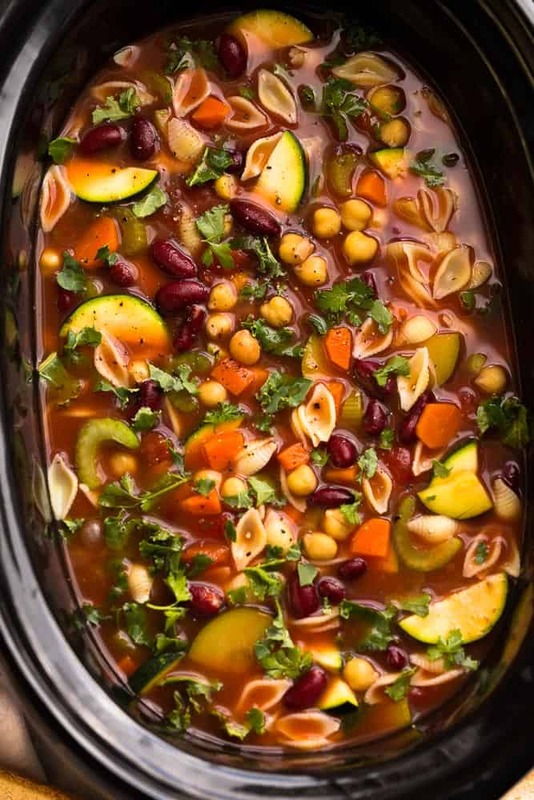 WHAT INGREDIENTS DO YOU NEED TO MAKE SLOW COOKER MINESTRONE SOUP? cannellini beans to keep you full for hours. The best part about any soup is that you can easily customize the veggies with what you like or have on hand – so feel free to change things up. I used small pasta shells to bulk things up even more. The secret to keep the pasta not soggy is by adding it 30 minutes before you’re going to serve the soup and cook on HIGH. If you plan on freezing this soup, I would leave out the pasta and cook it separately on the stove whenever you’re planning to serve it. That way, the pasta doesn’t end up getting soggy. Start off by chopping all of your vegetables. Soup is a great way to get rid of any leftover veggies you have in your fridge as well. Or, if you’re in a pinch, your local grocery store may also sell pre-chopped veggies just for soup. In a large 6 quart slow cooker, add carrots, celery, garlic, onions, basil, oregano, rosemary, thyme, diced tomatoes, tomato paste and bay leaves. Stir in vegetable broth and water (use less if you like it less watery) into the slow cooker and season with salt and pepper to taste. Cover with lid and cook on HIGH for 2-3 hours or LOW for 5-6 hours (time varies according to your slow cooker – adjust times as needed). Stir in spinach and season with more salt and pepper as needed and stir in balsamic vinegar (if using) and serve warm with bread and top with parmesan cheese and garnish with parsley if desired. ***NOTE about pasta – **If you plan to freeze this or serve the next day, leave out the pasta and cook on the side and then combine when you are ready to enjoy. This helps the pasta not get soggy. IS HOMEMADE MINESTRONE SOUP FREEZER FRIENDLY? Yes! If you plan to freeze or serve this soup the next day, leave out the pasta and cook in a separate pot. Then once you’re ready to eat, reheat the soup on the stove on low then add the pasta when you are ready to enjoy. Reheating the pasta before you serve the soup helps the pasta not get soggy. 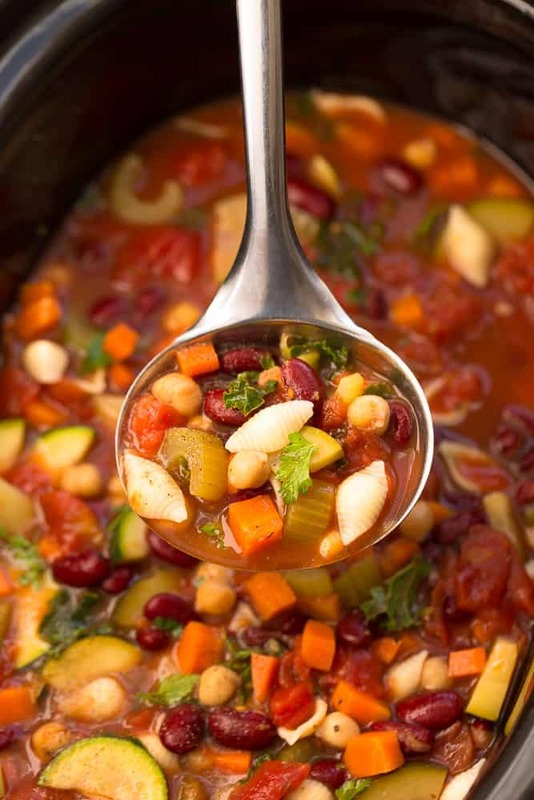 IS HOMEMADE MINESTRONE SOUP HEALTHY? This soup is packed with a ton of vegetables and legumes and contains tons of vitamins, protein and fiber. It’s also vegan and gluten free if you use a gluten free pasta. 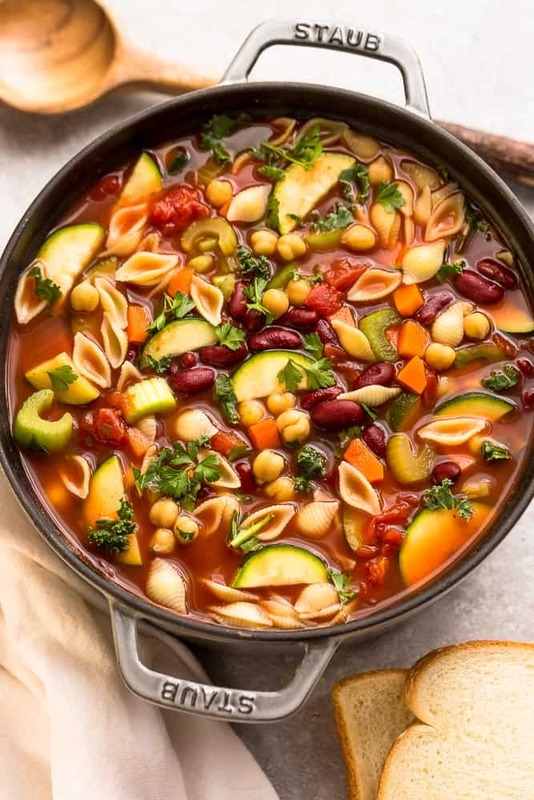 CAN I HAVE MINESTRONE SOUP IF I AM FOLLOWING A PALEO OR LOW CARB / KETO DIET? 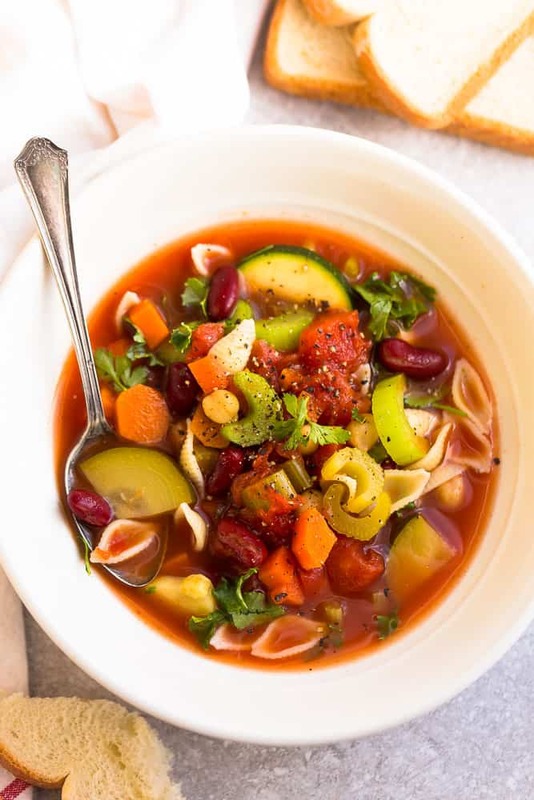 To make this minestrone soup low carb, keto and paleo friendly, leave out the pasta, beans and carrots and add cauliflower and green beans instead. CAN I MAKE MINESTRONE SOUP AHEAD OF TIME OR FOR MEAL PREP? Minestrone Soup is a sure way to keep you warm and cozy which is perfect if you are feeling under the weather. What a fun GIF, Kelly! I love these “set it and forget it” recipes. They give me more time to spend with the family rather than in the kitchen! This looks delicious and of course I love that it’s made in the slow cooker! I’m with you. Soups and Stews for winter survival! I have been looking for a good Minestrone recipe! I’m trying to make more soups now that it’s still cold and I’m trying to eat a little healthier — there are so many good things in this soup! I can’t stop eating soup right now, and minestrone is one of my favorites! I normally make mine on the stove top, so I need to try this slow cooker version. It looks delicious, Kelly! I’ve actually never tried minestrone, but this looks amazing! With noodles and beans and all those veggies. Yum! yummy!! That look so good!! Minestrone soup is an absolute staple at our house! But I’ve never done it in the slow cooker! I love that idea! Hope you’ve had a fantastic week Kelly!! It’s been forever since I’ve been to Olive Garden too. Oh, how I love their bread sticks. Since having my 3rd child I’m all about slow-cooker meals. Can’t wait to try this one, Kelly. Thanks for sharing. Happy National Homemade Soup Day Kelly! Of all the soups I’ve made, I’ve never made Minestrone and I would love to try this recipe – going on my list – thanks so much for it. BTW Your photos are gorgeous! You always have the best slow cooker recipes Kelly! This Minestrone looks incredible! I’ve never had the Minestrone at Olive Garden, but I’m sure this tastes better and is better for you! Love how hearty with vegetables it is! 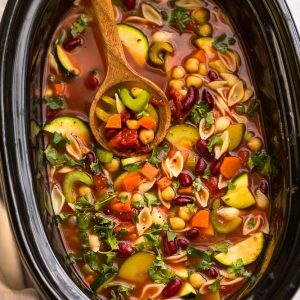 I LOVE minestrone soup, especially ones that are done in the slow cooker (check out my lazy side!) hehe! I love hearty soups like this! I need to add it to our menu soon! Homemade soups are SO much better than restaurants! So much healthier and not huge salt-bombs! This looks so yummy… I love all those veggies in there. And anything in the slow cooker is my kind of easy meal! Minestrone is one of my favorite soups too! I love that that’s what you had on your first date with your husband. That’s such a sweet memory. Hi Linda, sorry about that. I was updating my website so my recipe plugin was not showing up. It should hopefully work now. Thanks! Yum, this is my favorite!